Due to a last-minute conflict, Yavilah McCoy of Dimensions Educational Consulting was unable to attend the recent Mandel Center conference, Inside Jewish Day Schools. Instead, she graciously pre-recorded this stirring framing statement for our panel entitled “Embracing Diversity, Teaching Equity: Race and Ethnicity in Jewish Day Schools,” providing a context and a rationale for centering race and ethnicity in our conversations about teaching and learning and school culture in yeshivas and Jewish day schools. by Rabbi Judd Kruger Levingston, Ph.D. Attending this conference, Inside Jewish Day Schools, brought a welcome immersion in Jewish day school dilemmas, tensions, successes, and questions, some of which greet me every morning when I walk into my classroom. Participants came to the conference from universities, professional training programs, and from classrooms and administrative wings of Jewish day schools throughout the country. Each session provided opportunities to hear about research and practice; to question whose voices are loudest; and to consider whose voices from among our many stakeholders might go unheard and stay silent at any given moment. Should we emphasize depth or breadth? Should we continue to emphasize the teaching of Jewish texts in the original Hebrew or should we provide more materials in translation? When our students say that they love our school because it feels like camp, should we take them seriously and loosen up a little? Alternatively, when our teachers say that they wish our Jewish studies classes were more like AP Chem, because then our students will take our classes more seriously, should we take them seriously and toughen up a little? A single conference can’t answer every question, but it certainly validated that my colleagues and I at Barrack Hebrew Academy are not at all alone in wrestling with these questions. 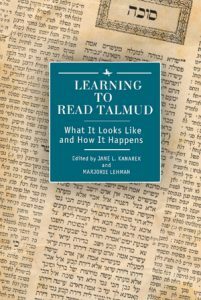 This post is by Jane L. Kanarek and Marjorie Lehman, editors of Learning to Read Talmud: What it Looks Like and How it Happens, which emerged from the Learning to Read Talmud project. It is excerpted from Ancient Jew Review. 1. What does it mean to read Talmud in your particular classroom? 2. What does this reading look like when it happens? Grounded in the scholarship of both rabbinic literature and practitioner inquiry, Learning to Read Talmud is a rare undertaking that uniquely bridges the worlds of academic Talmud and the study of pedagogy. It contributes to the growing field of the scholarship of teaching and learning. While most academics spend an enormous amount of time teaching, our institutions do not always recognize that teaching should be—and often is—an academic endeavor that involves critical study and analysis. Much as we write about the Talmud itself, we pay far less attention to the significance and contribution of writing about our teaching. With our book, Learning to Read Talmud, we aim to expand the research agendas of Talmudists to include scholarship on the teaching of rabbinic literature. As academic Talmudists—“insiders”—with a broad and nuanced understanding of both what the Talmud is and the vast range of approaches useful for reading it, we believe that professors of Talmud are uniquely reflective researchers of their teaching and the learning processes of their students. We are well-positioned to contribute both to the field of rabbinics and to the field of pedagogy. As articulated by K. Patricia Cross and Mimi Harris Steadman, “Teachers who know their discipline and the problems of teaching it to others are in the best position to make systematic observations and to conduct ongoing investigations into the nature of learning and the impact of teaching upon it.” Learning to Read Talmud is thus rooted in the many research traditions that define us as Talmudists. The eight case studies included in this book describe the types of teaching and learning that emerge from the very nature of the Talmudic text itself. They not only present examples of an array of teaching techniques but also offer insight into how one teaches for different reading results as dependent on the different contexts in which professors find themselves. Dr. Jane Kanarek is Associate Professor of Rabbinics at Hebrew College. Dr. Marjorie Lehman is Associate Professor of Talmud and Rabbinics at the Jewish Theological Seminary. K. Patricia Cross and Mimi Harris Steadman, Classroom Research: Implementing the Scholarship of Teaching (San Francisco: Jossey-Bass Publishers, 1996), xviii. Today we hear from Jane Kanarek (Hebrew College) who, with Marjorie Lehman (JTS), led the Mandel Center’s Learning to Read Talmud project. In June, they convened ten scholars of rabbinic literature to reflect on how students learn to read Talmud. Here, Jane considers how learning to read Talmud can cultivate certain dispositions in students. In its simplest and most straightforward sense, learning to read means learning to decode. It involves learning to assemble letters into words, words into sentences, and sentences into paragraphs. Of course, this understanding of reading is far too narrow. First, it ignores the importance of sense-making, of forming some kind of coherent understanding of these different words, sentences, and paragraphs. Second, it elides the fact that learning to read is not a linear process. Today we hear from Marjorie Lehman (JTS) who, with Jane Kanarek (Hebrew College), led the Mandel Center’s Learning to Read Talmud project. In June, they convened ten scholars of rabbinic literature to reflect on how students learn to read Talmud. Here, she shares some of the questions about teaching and learning that surfaced. Scholars in the field of Talmud and Rabbinics who also teach rarely have an opportunity to reflect, analyze, and discuss their successes and challenges in the classroom. While we attend academic conferences to discuss our work, and publish research in books and articles, we spend little time learning from one another about what we do in our courses or reflecting together on how the pedagogical decisions we make affect the learning outcomes of our students.